Payments plans are perfect for when you really want to secure your items and sizes but might not have the money at the time. Our payment plan gives you 8 weeks to pay off your items. All you need to do is make a 20% payment when you're reserving your items by using the "PAYMENT PLAN" code at checkout. 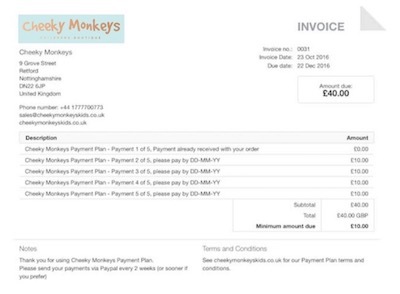 You then have 8 weeks to complete your payment.We send you a Paypal invoice for 4 payments of 20% that you pay every 2 weeks, or sooner if you prefer. All payment plans must be paid for using the Paypal invoice. We'll post your items as soon as you've paid in full. You can also collect from the shop if you prefer.